Requesting a trust with the NETID domain is a common way of making use of the automatically-provisioned Windows user accounts that correspond to UW NetIDs (hereafter referred to as NETID user accounts). After successfully obtaining a trust and configuring your resources with the appropriate access controls, you will be able to tell your clients to login with UW Windows user accounts to obtain access to your Windows domain-based resources. Determine what type of trust you’d like to obtain. Understand the implications of using a trust, and plan accordingly. If you have a firewall, ensure that the firewall does not restrict access to the NETID domain. Understand the landscape of the Microsoft Infrastructure. You’ll want to read about NETID users, NETID groups, MI Policy, and you may want to read the MI Architecture Guide. Review common ways you might use NETID across a trust, along with access control and group policy settings suggestions. Consider leveraging loopback group policy to apply group policy settings to any NETID users logging into your departmental domain computers. 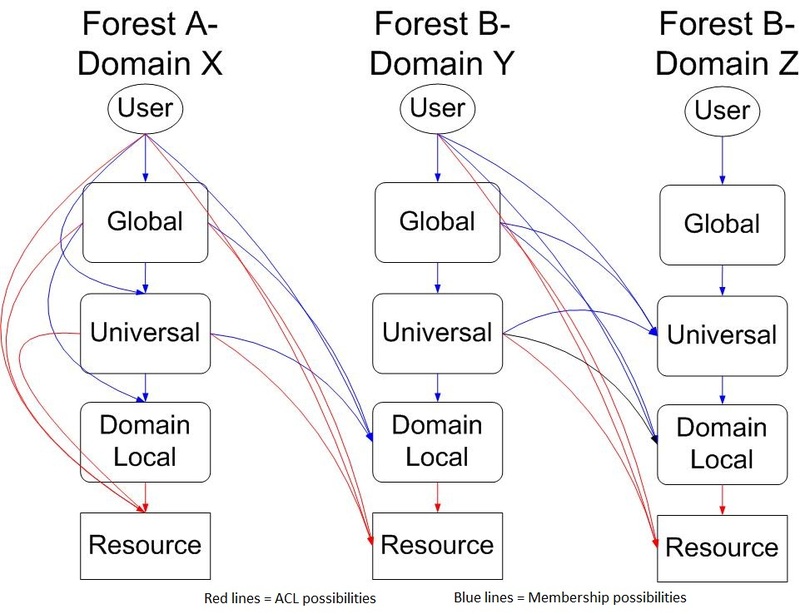 Consider using domain local groups in your departmental domain to contain NETID users and groups so you can grant access to computers and resources in your departmental domain. This diagram which shows the group membership and ACLing possibilities of different AD group types.